Wrap 1 slice of prosciutto around each chicken breast. Coat chicken in butter; rub in salt and pepper flakes. Heat 12-inch nonstick skillet over medium-high heat. Add chicken; cook 2 to 4 minutes on each side or until browned. Remove chicken from skillet. Add broth; heat to boiling. Stir in orzo and lemon peel; return to boiling. Place chicken over pasta. Sprinkle Parmesan cheese over chicken. Reduce heat to low; cover and simmer 10 minutes. 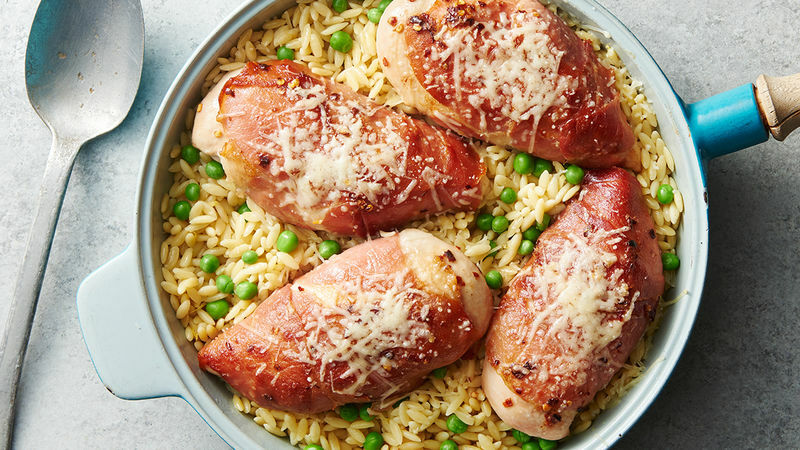 Stir frozen peas into orzo without disturbing chicken; cover and continue to cook over low heat 4 to 6 minutes or until most of liquid is absorbed, pasta is tender and juice of chicken is clear when center of thickest part is cut (at least 165°F). Opt for larger slices of prosciutto if possible to make wrapping the chicken easier. Can’t take the heat? Swap ground black pepper for the crushed red pepper flakes.